This is such a FUN math unit to teach! The kids love all of the hands-on activities we get to do, and I love how easy it is to keep them engaged. Try a few FREEBIES from this math unit in this post. I hope you enjoy them as much as we do. Our kindergarten didn’t have a math curriculum that aligned with the common core standards. So I finally created a unit for each kindergarten common core math domain, and I am so excited to share them with you. There are 5 Kindergarten Common Core Math Domains. Included in these units are everything you need to teach the standards throughout your school year! Right now, we are tackling GEOMETRY. 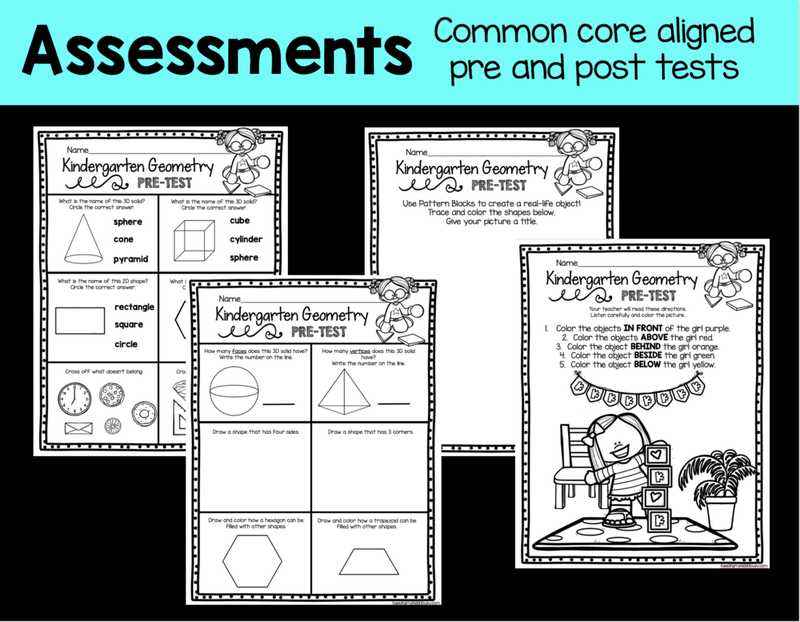 Like all of my math units, everything in this Geometry Unit is common core aligned and ready for you and your students to dive right into the standards! I did my best to organize this unit as I do all my math units – so it is easy for you to implement and use. I keep my math units in three-ring binders. I use page protectors to keep my lessons and black lines organized – no more filing cabinets to dig through! I love this because it keeps my papers nice and smooth, and it is so easy to flip through and see what I have. I can quickly grab exactly what I need to make copies and prepare for lessons. The pre and post tests are identical problems and questions - I just changed the specific shapes/solids/numbers on the questions. This will give you accurate data to chart student progress over the course of the unit. To go with the assessments are unit standard checklists! These checklists are an awesome tool to keep parents informed of exactly what their student will be learning over the course of the unit. I send home the black and white copy at the beginning of the unit and parents really appreciate knowing what their student is learning about.I also keep a color copy in my lesson plan binder as a quick reference for myself. To practice 3D solids are these fun Color Me 3D pages. Students simply color the correct 3D solids and trace the names. Standard CCSS.MATH.CONTENT.K.G.B.6 can be tricky for students but we love doing these composing shape activities. Students cut out the pattern blocks and arrange them to make two larger triangles. They then record how many of each shape they used. It is so fun to see them arranging and playing with the shapes to make them fit into a triangle. They also get to make a shape house which is a fun, open ended activity. I actually like to send this activity home for students to complete with their families. They then bring them back to class and we share and discuss the similarities and differences in our houses. These geometry activities can be completed whole group, with partners or independently. 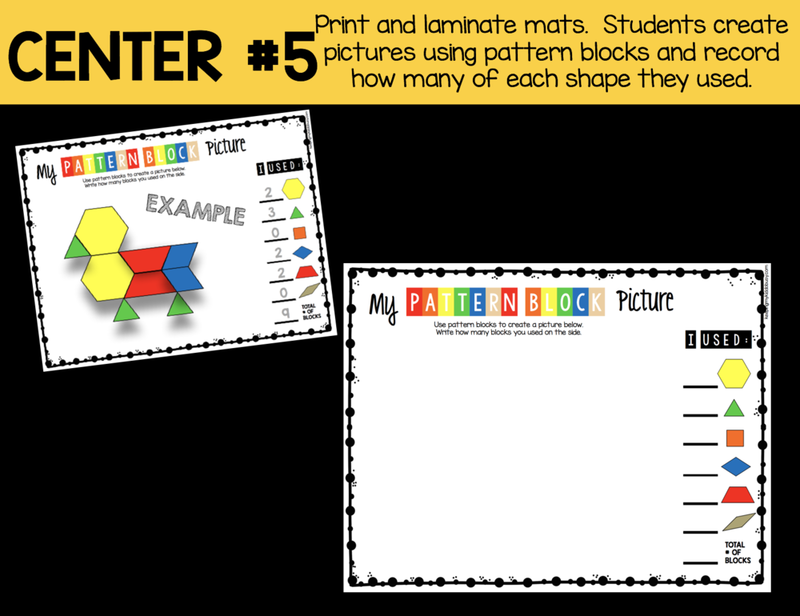 See how many different ways students can use pattern blocks to fill up the hexagons. They trace and color the pattern blocks and it is an awesome way for student to practice composing hexagons. The Roll and Trace and Roll and Colorgames are an easy and fun activity to practice 2D shapes and 3D solids. All students need is a pencil/colors and a die. They can play together or independently. It makes for an easy center or class activity. Try an activity for FREE! Do you use math journals? These make for awesome warm-up activities or even complete lessons!You can print these for every students, or just use your projector and students can do the problems in their journals. I read the problem to my class and we discuss. I let students think, pair, share and we dive right in!These problems really get students thinking about how shapes are composed, how they fit together, etc. Students just need pattern blocks and a pencil! I love listening to them discuss and watching them use the blocks to solve the problems. It is so fun watching them come to their own conclusions and watch the light bulb CLICK! Here is a peek at our Geometry Centers! Scroll down to grab a center for FREE! Practice 2D shapes and 3D solids, composing shapes, sorting pattern blocks, geometry vocabulary and MORE with these fun, hands-on centers. Two versions included! Use one or both.Hang cards around the room for students to go and find with their recording sheet, or you can simply have students shuffle the deck and flip the cards over at their seat. Ready to get going on this geometry unit?! 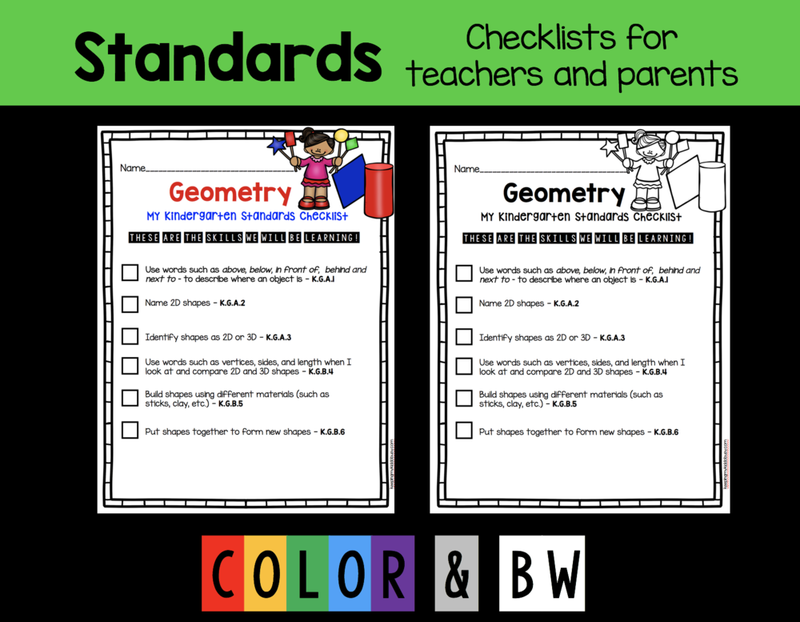 You and your kiddos will have so much fun with these standards!